The temperature and composition of food, during the printing process, maybe a key factor impacting on rheological properties. Currently, there is no evidence of authors analysing the effect of printing temperature on the characteristics of final products. 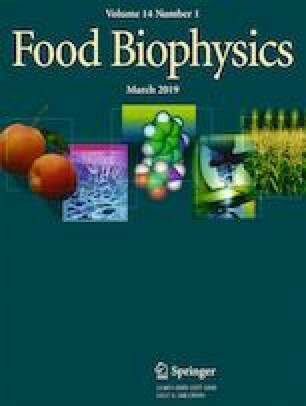 The aim of this paper was to study the printability of potato puree when affected by printing variables, such as printing temperature and the composition of the potato puree. The printing temperature was studied at 10 °C, 20 °C and 30 °C, and the effect of the product composition on the printability was studied by analysing the rheological and textural properties. Viscosity-temperature profiles, flow curves and dynamic oscillation frequency analysis of potato puree were some of the techniques used in rheology analysis. Forward extrusion assays of formulated potato puree were used to study the compression force in the 3D printer. Results showed the formulation with higher content of dehydrated potato puree (38 g of dehydrated potato puree in 250 mL of whole milk) at a temperature of 30 °C were the most stable. The printability increase with the amount of the consistency index and the reduction of behaviour index. The mean force from extrusion test was correlated with printability but the effect of temperature did not help define this parameter.